The weather was overcast with a fickle South Easterly wind for the 13 yachts starting the Cockwells sponsored Saturday series. There were a few Q class missing as the traditional L’Aberwrach race had started on Friday evening. The Race Officer, Kevin Maclean, had set the courses in good time. We set the sails and running rigging on the mooring and cast off with 18 minutes to our start to get a feel of the wind and tide. As we maneuvered for the start we saw “Mummy Duck” and her clutch of 8 ducklings paddling across the start line toward FSC quay. With dismay we saw a lone straggler trying desperately to keep up. The Hen turned back several times and brought it to the clutch but the poor thing just lagged further behind! A Greater Black Backed Gull had designs on an early tea. We sailed directly at the gull, which left the scene and then picked up the duckling. Giles the boatman then took it from us and attempted to return it to the fold. Right then Minx took off as the lone Q class and 5 minutes later a gaggle of 6 U class yachts started and beat out of the fairway. We though we had set up a good start being on starboard and to weather of the fleet. But not a good start for Trifle Mandy Owens in Aurora went off like a rocket on port tack followed closely by Nigel and Jess Rowe in Kaimana. The wind came and went in direction and force. Kaimana eventually took the lead and we saw her dive off onto port tack toward the western shore followed by Aurora. We continued on starboard tack heading for the narrows channel and an ebb tide. 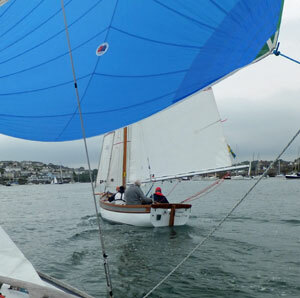 We were joined by Wilkie, Bob Chapple to windward and Ida, Mike Swingler to leeward. Mr G, Tim Dewhurst was way behind in his Hawk 20. The old adage “There’s more wind in the middle of the river” worked and Wilkie forged ahead to the eastern shore tacked down tide and only just ducked Kaimana coming across in a new wind. We stood on right under St Mawes Castle and just ducked Aurora by the Castle Buoy. Ida had tacked away early and got headed off. Kaimana made Carricknath to port first, followed by Wilkie. We crossed Aurora and were third around. Then a long kite run downwind and against the ebb tide to North Bank taken to port. We could see Minx, Charles Choak, had reached across toward the Trefusis point but she had slipped backwards in the tide. Kaimana and Wilkie went straight for North Bank and we followed with Aurora and Ida behind. We watched Minx go up the Trefusis shore toward the club and saw Katy, Sue Grigg in G class tacking up toward the Castle buoy. Kaimana rounded North Bank followed by Wilkie and went up quite high toward the harbour. When we rounded, disaster! We were headed toward Trefusis. As we approached the shore and set up for the tack, Gay Slater my guest crew informed me of a big lift. Whew we crossed fingers and got a lift all the way up the shore some 10 feet from the rocks. We met up with Katy coming in from the Narrows buoy and lifted above her and set a shy kite for the run to the finish. 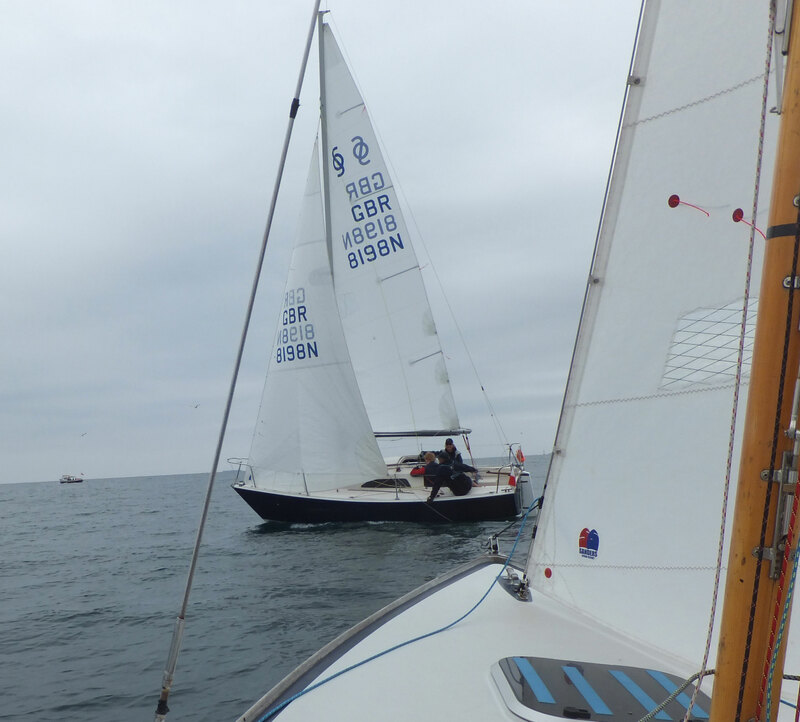 Amneris, Mike Robson appeared in our sights as the sole W class yacht finishing on a shorter course ahead of us. We went back to the club where Kariad had prepared some excellent cakes to be washed down with tea and lemonade for the boys. Thanks to Jeannete and Kevin's crew in the ops room. Sue Clark for processing the results and Giles the boatman who has a new pet! A big thanks to Dillon our new 9 year old second helm on the launch.